WE ALWAYS MAKE BESPOKE CRANES ON THE BASIS OF THE CUSTOMER'S SPECIFIC NEEDS. WE ARE FIRST ON OUR MANY YEARS OF EXPERIENCE, KNOWLEDGE OF CURRENT TECHNOLOGIES AND LARGE VARIABILITY OF OUR RANGE COMPONENTS. Underslung cranes are a variant of bridge cranes; the difference lies in the fact that the wheels are suspended on the crane runway on the underside, on the bottom flange. 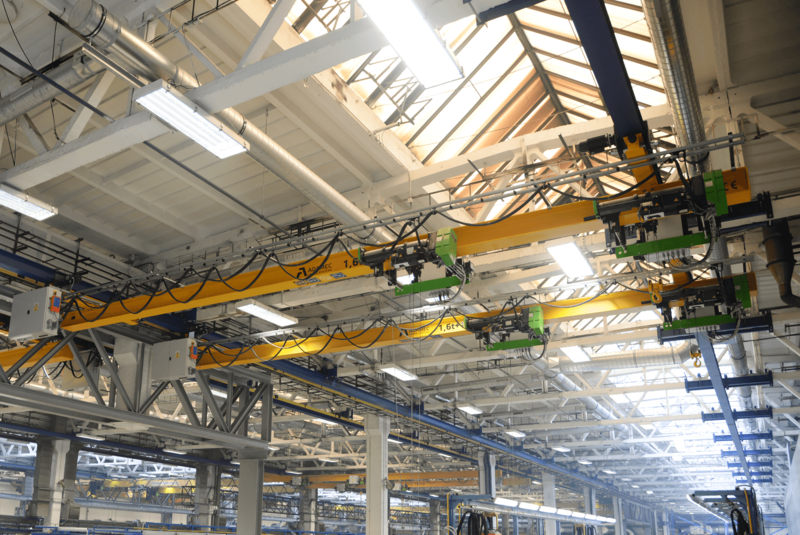 This solution is usually used when it is necessary to suspend the crane runway from beams or any type of ceiling.